Cheviot Hotel, North Canterbury Accommodation. Accommodation Options. At Cheviot Hotel , we offer a range of accommodation options suitable for families, single travellers, backpackers and corporate business travellers. Also check out our Camping Ground page for further options. This comfortable modern unit contains a lounge area and great kitchen facilities. The lounge opens out to a private sunny deck. The unit also has its own wheelchair accessible bathroom. Of the two separate bedrooms, the master bedroom is fitted with a queen bed, while the second bedroom has one single bed and one king single. This unit has an attached carport and a 32 inch Sky television. 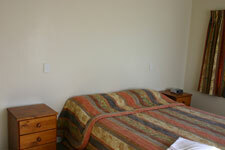 Enjoy the comfort of this modern one bedroom Motel unit, with a large separate double bedroom, with a king bed. The lounge area opens out to a private sunny deck. This unit offers modern kitchen facilities and a modern bathroom. This unit also has an attached carport and a 32 inch Sky television for your convenience. 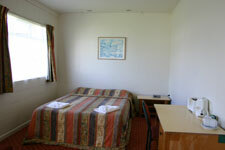 Our large modern studio room contains a queen bed and ensuite. The lounge features a 32 inch Sky television, and the small kitchen area offers a toaster and tea and coffee making facilities. This double hotel room features a Queen bed and modern ensuite. Enjoy a Sky television, toaster, and tea and coffee making facilities. This compact Single Hotel Room features a king single bed, ensuite, Sky television, toaster and tea and coffee making facilities. A great room for corporate travellers! 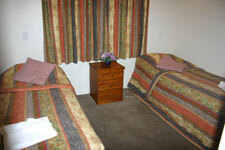 Our Twin Hotel Room at Cheviot Hotel, offers one single bed, one double bed and an ensuite bathroom. 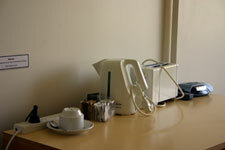 This room also features a Sky television, toaster and tea and coffee making facilities.